On 18 November 2017, His Eminence Archbishop Angaelos was enthroned as the first Coptic Orthodox Archbishop of London, having served as General Bishop of the Coptic Orthodox Church in the United Kingdom since 1999. In addition to this new role, His Holiness Pope Tawadros II, Pope of Alexandria and Patriarch of the See of Saint Mark, has also seen it fit that he continue representing the Church in the United Kingdom at the ecumenical and official level as Papal Legate, and thus conferred him with the ecclesial title of Archbishop of London. Archbishop Angaelos is widely recognised for his extensive advocacy work, and as a result he was conferred the honour of Officer of the Most Excellent Order of the British Empire by Her Majesty The Queen for ‘Services to International Religious Freedom.’ Archbishop Angaelos has also been conferred the Lambeth Cross for Ecumenism by the Archbishop of Canterbury and the Coventry Cross of Nails for Reconciliation. With a pastoral ministry spanning more than two decades, Archbishop Angaelos specialises in youth ministry and travels around the world to speak at youth conferences and conventions. Having commenced his pastoral ministry in the United Kingdom in 1995 as a parish priest, Archbishop Angaelos was consecrated a General Bishop in 1999 by His Holiness, the late Pope Shenouda III, with whom he served as private secretary. He was Proclaimed Bishop of the Coptic Orthodox Diocese of London by His Holiness Pope Tawadros II, and the Holy Synod of the Coptic Orthodox Church during a historic service at St Bishoy Monastery in Wadi-El-Natrun, Egypt. Archbishop Angaelos specialises in initiatives relating to advocacy, international religious freedom and development work, and is a member of, and chairs, numerous local, national and international bodies dealing with these matters. He is founder and convener of the Asylum Advocacy Group which works closely in partnership with the All Party Parliamentary Group on International Religious Freedom or Belief. Archbishop Angaelos frequently issues statements and comments relating to current religious and minority issues, with his particular focus on dialogue, conflict-resolution, and reconciliation. His comments and views are frequently sought on matters of human rights, civil liberties and international religious freedom, particularly in relation to the situation in Egypt, the Middle East, and North Africa. He has visited refugee camps in Greece, Lebanon, Kurdistan, and Jordan, and continues to work tirelessly to promote collaboration across the whole spectrum of his official, ecumenical and inter-religious engagements, to facilitate the support of and assistance to those in greatest need and suffering persecution and displacement. Archbishop Angaelos was born in Egypt and emigrated to Australia in his early childhood with his family. After obtaining his degree in Political Science, Philosophy and Sociology, he continued on to postgraduate studies in law while working in the same field. In 1990 he returned to Egypt to the Monastery of St Bishoy in Wadi-El-Natroun where he was consecrated a monk by the late Pope Shenouda III and served as his private secretary until 1995 when he was delegated to serve in the United Kingdom. 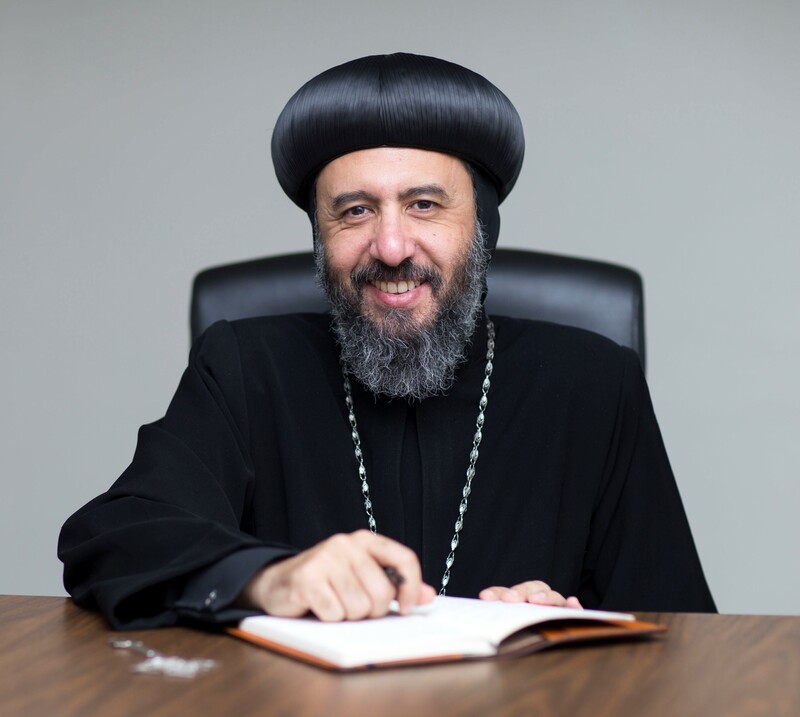 He was proclaimed Bishop of the Coptic Orthodox Diocese of London on 11 November 2017 in Egypt, and enthroned over the new Diocese on 18 November 2017 at the Cathedral of Saint George in England.